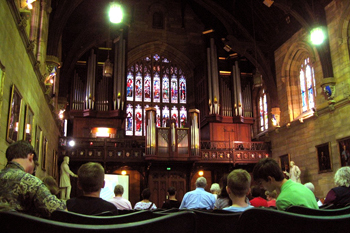 Sydney University 6th November 2011. A musical Grand Tour of Baroque Europe …..
With an international reputation as an organist and harpsichordist, Douglas Hollick studied with Peter Hurford in St Albans, Marie-Claire Alain in Paris and Gustav Leonhardt in Amsterdam. He has played widely both here and abroad, and teaches in Cambridge, and at the Birmingham Conservatoire. He has recorded twice for Czech Radio and in 1995 he recorded an organ CD entitled The Young Bach for Supraphon in the Czech Republic which attracted very favourable reviews. 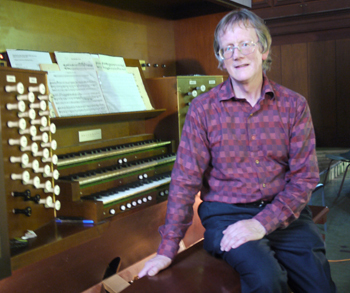 Douglas Hollick was awarded a year 2000 Churchill Fellowship to visit North Germany and Denmark to research the organs and other keyboard instruments from the period of Buxtehude and the young J S Bach. Recent years have seen him playing fortepiano as well as organ and harpsichord, complementing his interest in the music of the late 18th and early 19th centuries. The Dussek Duo with harpist Eleanor Turner is one result of this, pairing his 1809 Broadwood grand with an Erard Frères Paris harp of 1820. This programme follows the idea of a tour around Europe in the 17th and 18th centuries - Italy, Spain, England and France framed by Germany - and picks up many musical ideas which travelled and mutated as musicians visited different countries to study and work. There is also a link with the idea of variations, both in chant and chorale, and on an ostinato or repeated theme in Pachelbel’s Ciacona and the grander scale of Bach’s great Passacaglia. Since we are close to the season of Advent in the church year, the Magnificat and Advent chorale settings are particularly appropriate. Matthias Weckmann occupies a pivotal role in the development of North German organ music. He was a protégé of Heinrich Schütz in Dresden, who sent him as a young man to study with Jacob Praetorius in Hamburg, himself a pupil of Sweelinck. Through Schütz – a pupil of G. Gabrieli - Weckmann would have come into contact with Italian music, as he would also have done through his friend and contemporary Froberger, who had studied with Frescobaldi. Also through Froberger, Weckmann would have been aware of French music, so in his music we have a real synthesis of these different influences on the native German style which were to reach their ultimate conclusion in the music of J S Bach. In 1655 on the strength of a quite ‘extraordinary’ audition Weckmann was appointed organist of the Jacobikirche in Hamburg, a post he held up to his death. His setting of the Magnificat on the second tone consists of four verses: the first in five parts with the plainsong in the tenor, the second in four parts Auff 2 Clavir with a typically florid treble solo, the third in five parts with the plainsong in alto or tenor played on a high pitched pedal stop and the fourth final verse in a rich six part texture. The specific genre of toccata for the elevation during the Mass had by Frescobaldi’s time developed into the typical very chromatic and often dissonant style (con durezze e ligature) which paralleled the intensity of the moment in the service. It is a style one sees taken up elsewhere in Europe, and not only in Catholic organ music, and was always registered on the Voce Umana – two ranks of Principal pipes where one is slightly out of tune to create an undulating effect. This lovely example comes from Frescobaldi’s Fiori Musicali of 1635, a collection of mainly liturgical music which Bach copied in Weimar in 1714. Little is known about Francisco Peraza, but he is known to have become organist at the Cathedral of Sevilla in 1594. In his lifetime he was famous for the inventiveness of his ornamentation or flores, and this is certainly borne out by this wonderful piece which exploits the typical divided single manual of the Spanish organs – medios registros. In this case the solo is high in the right hand. Purcell’s lovely Voluntary in G has two short sections – an opening of slow moving chords and harmonies which brings to mind the Italian Elevation toccatas with their dissonances and suspensions, and a succeeding swift imitative movement. John Stanley was blind, but this did not prevent him from becoming one of London’s most well known 18th century organists. His Voluntaries were published in three sets, and show a great variety of structures and registrations. Number seven from the second set is marked ‘Full Organ’ and has an introductory Largo followed by a swift Fugue. Full Organ at this time in England is nothing like it became in the Romantic organ, or indeed like the Organo Pleno of Bach, but would still have been a very rich full sound, often including the Great Trumpet; in both movements he exploits the use of echoes to a second manual. André Raison was organist at the royal abbey of St Geneviève in Paris from about 1666, and was regarded as a player of the highest rank. He was the teacher of Clérambault, whose Livre d’Orgue was dedicated to Raison. The first of these short pieces, the Trio en passacaille from his 1688 Premier Livre d’Orgue, has a theme the same as the first half of the theme of Bach’s Passacaglia. The Basse et Dessus de Trompette was a favourite device of the French organists, with sometimes rapidly alternating right and left hand solos, and not a little element of humour in the process. The Cromorne en Taille is quite different – gentle and intense, with an ornamented solo line in the tenor register. Pachelbel was a much more direct influence on the young J S Bach, since the older brother who took him in after their parents had both died was one of his pupils. This Ciacona is one of a number of organ works based on ostinato themes which were copied into the Andreas Bach Buch, compiled by that older brother, Johann Christoph, and added to over a period of years. The other ostinato based organ works include the Buxtehude Ciaconas in C minor and E minor, the Passacaglia in D minor and the C major Praeludium with a Ciacona as the final section. Also copied here and of particular interest is J S Bach’s own Passacaglia & Fugue, the text of which is perhaps the nearest to an autograph copy that has survived. Pachelbel weaves a most wonderful variety of texture over an unchanging five note ascending bass. The C major Praeludium by Buxtehude is a typical sectional work, but unusually concise in form. A free opening leads to a fugal section, and the work concludes with a further free section. Despite its modest proportions this delightful exuberant work shows many of the characteristic rhetorical gestures which became such an important part of the organ music of North Germany at this time. His short setting of the Advent chorale Nun komm’, der Heiden Heiland must surely have been known to Bach, and the octave leap up near the end is also seen in Bach’s setting – a gesture common in 17th century North German organ music which Bach develops way beyond his model. Bach’s much longer setting comes from the collection known as the ‘Eighteen Chorales’, the final versions of which date from Leipzig, but which have earlier versions dating from Weimar. The chorale is in the treble, elaborately decorated, and with a string-like accompaniment which is itself extraordinarily beautiful. This is a truly wonderful work of genius! Bach’s Passacaglia & Fugue which completes the programme has its roots in the works of Pachelbel and Buxtehude already mentioned, but it is not known if Bach was aware of the French organist André Raison, whose piece based on the same theme was heard earlier in this programme. Much has been written about the numerological significance of the hidden symmetries in this work, but from the listeners point of view these ideas are not important, since Bach’s consummate skill means that one simply hears a work which is completely satisfying in the balance of its proportions. The Fugue is essentially a final extended variation, and in the text is linked through without a break. The only registration instruction which has come down to us in some copies is ‘Organo Pleno’, although for such a long and sectional work it seems unlikely that a player of Bach’s imagination would not have varied this at all. My interpretation, as with everything in this programme, is based on what is possible with minimal stop changes on an organ of the period.